The 1960s is often heralded as the decade that reshaped and invigorated the fashion world, but in my opinion, the 1920s are not given enough credit. A shift in attitude towards dressing in the later years of the decade paved the path that fashion has since moved along, occasionally wandering but always reflecting on its origins and taking cues from the era. As the 1920s progressed, technology, jazz and marketing all expanded and evolved – although it is often felt that the traditional attire most men wore at the time did not reflect these advancements. The focus of this article is on the later years of the 1920s, which was a period draped in luxury and extravagance. Fashion of the 1920s is characterised by two contrasting periods, where tradition and resourcefulness preceded the extravagance of the ‘Roaring Twenties’. Post World War I, fabric was something of a luxury. Returning soldiers, as much as the public, were keen to put the horrors of the war behind them and this meant that the classic Victorian garb and military jackets were to be replaced. It wasn’t that fashion was responsible for the disregard of conventional mores of the time, but fashion was certainly part of an avant-garde movement led by artists all over Europe, who were trying to affect the arts. They attempted to readdress the distinct gap between art and life; it was their belief that there was no division between ‘fine’ art and ‘applied’ art. Inspired designers began to fuse luxury and practical wear, throwing restrictive dress out the window, whilst a period of global economic boom meant a tide of opulence and elegance swept the nation. Regimented, formal dress made way to freedom and expression – values that wove their way into the very fabric of the fashion industry. In the 1920s, colour was kept to a minimum. Suits were typically neutral in colour but any garments in shades of cream were usually a sign of extreme wealth and suaveness. 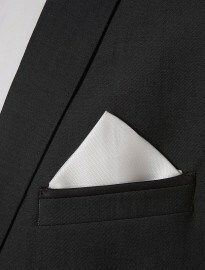 Accessories such as pocket squares, pocket watches and boutonnières remained monochromatic, with a clear emphasis on the whole outfit rather than any individual aspect. Jackets were usually single-breasted and tended to have wide, peak lapels, which would finish towards the breast rather than higher up – like most modern counterparts. Underneath, double-breasted vests were often paired with an accompanying pocket watch; a combination that many contemporary style icons, as well as designers like Hackett and Ralph Lauren Purple Label, have been utilising recently to great effect. Pinstripe was a popular choice of pattern at the time and its existence among the elite of society was perhaps the source of its negative connotations today. Matt Allinson has already detailed how to bring the pinstripe suit up to date, and with the strong vertical lines giving off the impression of power and confidence, it is a pattern that works well for men who embody the same characteristics. Club collar shirts in white or light blue were often anchored by ties with small geometric patterns, completing the top half of a customary 1920s outfit. When trying to introduce wide-legged trousers into your own wardrobe, it is worth noting that those with longer legs will be able to pull off this look most successfully. Those who are shorter in height should instead opt for slim and tapered cuts, which will help lengthen the appearance of your legs. A source of inspiration for the 1920s look can be found in the 1974 film adaptation of The Great Gatsby, starring Robert Redford. While the film has nothing on the novel, the costumes worn won an Academy Award and highlight the glitz and glamour of the era in all its glory. The film also includes the regular use of cable knit jumpers in a casual environment, referencing the arrival of sportswear into men’s fashion. Sportswear has been a mainstay of the catwalk for a few seasons now and it was in the 1920s when the benefit of exercise became common knowledge. The lookbook below picks out key pieces from the 1920s and shows you how to incorporate them into a modern day outfit. Aside from the flamboyance of the era, the twenties were also renowned for advancements in air travel, thanks to Charles Lindbergh. With that in mind, the aviator jacket has much historical significance and is the perfect piece of statement outerwear to complement the popular wide pinstripe suit. 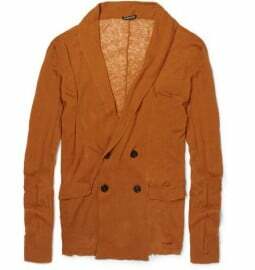 In a dark, neutral colour with a good structured shoulder, the foundation of the outfit is complete. Underneath, a double-breasted cardigan provides a soft, louche touch to an otherwise imposing silhouette. In the 1920s, as casual wear became more acceptable, separates were utilised to breach the divide between formal attire and sportswear. This smart-casual way of dressing is not new to us but to relay the signature aesthetic of the period, a little twist on our definition is needed. 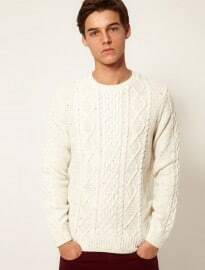 Try a cricket jumper in its traditional form – cable knit, v-neck, cream in colour – over the top of a white unbuttoned shirt, with a cravat (that picks out a colour in the bands on the jumper) tied loosely around the neck. The 1920s is a decade that is rightfully coming into the limelight again. It is an era that holds a lot more influence over fashion than most people realise, but it still retains an aura all of its own; one crossed with fantasy, power and of course, luxury.